My paper at the second workshop attempted to deepen current understanding of the role of the ether of space in Oliver Lodge’s long-term project to explore the connections between physics and psychical research. It suggests that by the 1890s the nagging problems that physicists faced trying to understand the nature of the ether were seen by Lodge as possible ways of exploring psychical phenomena – phenomena that he believed occupied a ‘borderland of physics and psychology’, of mind and matter, and of science and religion.1 By this time, it was increasingly clear that the ether could no longer be understood in the way it had for decades – as form of ordinary, ponderable matter. The need for the ether to be an electrical and magnetic, as well as a luminiferous, medium required it to be altogether more complex in nature and structure. Experiments by Michelson and Morley in the 1880s and by Lodge in the 1890s gave contradictory results as to the relationship between ether and ponderable matter, and compounded the ether mystery. Yet the ether’s necessarily extraordinary nature excited Lodge. Like so many physicists at the turn of the twentieth century, he recognised the severe limits of Newtonian dynamics and suggested that an electrical or ethereal dynamics was an altogether more satisfactory way of understanding the physical cosmos. But Lodge also thought this constituted the most promising step to date towards physics embracing life and mind – those questions typically eschewed by physicists. Lodge’s increasing interest in investigating the wider, vital, mental and psychic functions of the ether sprang from at least four concerns. First, the establishment of long-distance wireless telegraphy (including Lodge’s own system of syntonic wireless telegraphy) was perceived as an additional argument for the reality of an ethereal medium that could be indirectly manipulated. Second, after many sittings with spiritualist mediums, Lodge needed an ethereal medium to furnish a possible physical ‘vehicle’ by which the personalities of the dead could commune with the living, a belief in which he first publicly declared conviction in 1902. Third, he needed an ether to explain the apparent capacity of the body to exert intelligent or directed forces beyond its material limits. In 1894-5 he had attended seances with the spiritualist medium Eusapia Palladino and was convinced that she displayed genuine ‘telekinetic’ powers, despite later agreeing that she often resorted to fraud. Fourth and finally, Lodge’s close friendship with Frederic W. H. Myers, the classicist, poet and psychical researcher, encouraged an altogether more creative approach to physical and psychical analogies (especially those of ethereal and psychological/spiritual ‘spaces’) and a greater boldness in using physics to intervene in wider debates about the implications of the sciences for Christian belief. Lodge’s ambitions for exploring the ether, and in particular its psychic functions, were frustrated by the heavy administrative duties he had to fulfill after 1900, when he became first Principal of Birmingham University. This position left him little time for any original scientific research, let alone the potentially time-consuming and expensive experimental investigations into the ether. However, he was able to explore the ether question using the literary skills that were already helping his reputation and income. From the 1900s onward he had a much more ambitious view of the domain of his scientific authority and addressed his interpretations of physical and psychical researches to audiences of theologians, philosophers, spiritualists, statesmen, educationalists, and wireless operators, as well as the physicists, electrical engineers and psychical researchers who constituted his main audiences in the late nineteenth century. While the ether was being increasingly marginalised in specialist physics publications, it enjoyed a remarkable ‘post-relativistic’ afterlife in precisely these wider scientific, technical, philosophical and religious circles. Not surprisingly, it was in a 1919 number of the Hibbert Journal, a leading forum of theological and philosophical debate, that Lodge first detailed his most elaborate exploration of the ether’s psychic function: the concept of the ‘ethereal body’.2 This was the idea that since all matter is held together by ether, then all matter has an ethereal counterpart. Since animate matter had an obvious psychic significance, then its ethereal counterpart was at least as likely to have one since it wasn’t materially constrained. Moreover since the ether didn’t suffer from friction, radioactive decay or other ‘temporal disabilities’ then it was possible that the ethereal body and its associated psychic function survived bodily death and thereafter enjoyed a ‘livelier existence’ (258). In a plethora of books, articles and broadcasts in the 1920s and ‘30s Lodge made the ethereal body a major aspect of his speculation on the way physics could lend credence to psychical research’s evidence for post-mortem survival and to the Christian idea of the spiritual body. Lodge was equally subtle about his ‘determinism’. He agreed with his old scientific mentors John Tyndall, W. K. Clifford and T. H. Huxley that the cosmos was ultimately law-bound and that there was no place in it for caprice and uncertainty. However, he disagreed with their view that the only knowledge that humans could have of the ‘totality of things’ was of matter in motion.5 He agreed that humans could never apprehend this ‘totality’ but insisted that ether physics and psychical research had got them closer to it than a simplistic and restricted ‘materialistic’ determinism. Lodge’s determinism was altogether more comprehensive than this and saw mind and spirit, as well as matter and motion, as parts of the universal chain of causation. For Lodge this was entirely consistent with his underlying belief in an intelligible, continuous and Divinely-guided cosmos and it’s not surprising that he objected so severely to the view, widely associated with the popular writings of Arthur Stanley Eddington, that the indeterministic physics of the quantum made religion possible for the ‘reasonable scientific man’.6 For Lodge, religion been eminently reasonable decades earlier with a superdeterministic cosmos suggested by ether physics and psychical research. Portait of Raymond Lodge, from Raymond; or Life and Death (London: Methuen, 1916), n.p. Haunting the peripheries of Oliver Lodge’s classic spiritualist work Raymond, or Life and Death (1916) is the figure of Lieutenant Eric Fletcher, close wartime companion of the book’s eponymous spirit protagonist and early recipient of the then nascent diagnosis of shellshock.1 “He went off for a rest cure yesterday morning,” records Raymond Lodge in a letter from the front sent in late May, 1915. “He is my greatest friend in the Battalion, so I miss him very much and hope he won’t be long away. He will probably go back to England, however, as his nerves are all wrong. He is going the same way as Laws did and needs a complete rest” (39). 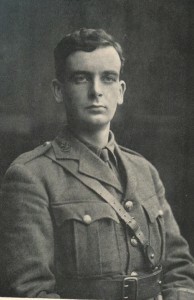 Although Fletcher remained a regular presence in the young Lodge’s correspondence until the latter’s death later that year, he leaves little trace in the afterlife communications allegedly channeled by the spirit Raymond to his grieving father through the London mediums Mrs Gladys Leonard and Mr A. Vout Peters in the autumn of 1916. In my talk at the second Lodge workshop, I argued that the phenomena of shell shock nonetheless remains central to Raymond and Oliver Lodge’s spiritualist philosophy during the inter-war years, coming to serve as perfect analogue for the disembodied spirit as it struggled to communicate from, and adjust to, its newly disembodied state. Raymond by no means represented Lodge’s first spiritualist publication — indeed, the wireless pioneer had been active in the continental psychical research scene since the eighteen-eighties — but when it appeared, it was immediately recognized as belonging to a different category than his earlier forays into the field such as The Proofs of Life After Death (1902) and The Survival of Man (1909).2 More personal than these, it struck a chord with the thousands of parents in Britain and around the world who had lost their own sons to the war effort, and quickly became one of the best-selling spiritualist books of all time. It also became the most recognizable example of a new sub-genre of spiritualist writing, namely, the spirit soldier biography, one that narrated the continuing adventures and sometimes sustained battle engagement of combatants on the other side. Including such works as War Letters from a Living Dead Man (1915), J.S.M. Ward’s Gone West (1917), and Wellesley Tudor-Pole’s Private Dowding (1917), the genre aimed to reconcile the unprecedented violence and devastation of modern technological warfare with spiritualism’s hopeful promise of universal human progress both on earth and in the afterlife.3 It also, to varying degrees, had to contend with the unruly and sometimes nonsensical nature of the séance messages it compiled as evidence, transforming what seemed like error or even gibberish on the part of the alleged communicants into logical and consistent evidence of post-life survival. In Mott’s shell shock victim, temporarily but not permanently impeded from communicating in a normative way, Lodge found an ideal and medically legitimate explanatory model for the messy and incomplete nature of séance speech. The dead soldier, like the shell shock victim, was disoriented by his new state of being and required the support of an adept practitioner who could provide fleshy, material support for his unvoiceable experience. “[I]t is through physical phenomena that normally we apprehend, here and now; and it is by aid of physical phenomena that we convey to others our wishes, our impression, our ideas, and our memories,” Lodge surmised. “Dislocate the physical from the psychical, and communication ceases. Restore the connection, in however imperfect a form, and once more incipient communication may become possible” (330). Yet Raymond’s appropriation of trauma, and of war neuroses in particular, as explanatory device sat directly at odds with both the spiritualist movement’s optimistic cosmological schema and its insistence on the retention of personal identity, echoing, in fact, the challenge to patriotic and triumphalist approaches to the Great War posed by shell-shocked veterans in the secular sphere more broadly. The spirit solider biography insisted that the living-dead were still fit for service; the stuttering and often inaccurate messages sent from the Great Beyond suggested, on the contrary, that they were not. Similarly, the version of Raymond Lodge channeled by Mrs Leonard and Mr Peters is both eager to serve and yet doubtful of his ability to do so: “I almost wonder,” he reports through the spirit guide Feda, “shall I be fit and able to do [work]” (98). The spirit Raymond also appeared unable to recognize the ongoing effects of the fatal physical wounds on his new subtle body, ones that his medium could sense even if he could not. In her first sitting with Oliver Lodge, Mrs Leonard claimed that her spirit guide Feda could sense “ a string around her head; a tight feeling in the head, and also an empty sort of feeling in the chest, empty, as if sort of something gone . . . also a bursting sensation in the head . . . [Raymond] does not know he is giving this. . . [b]ut Feda gets it from him.” (127). If the devastating injuries acquired during combat continued to effect identity after death and persisted in thwarting the attempts of dead soldiers to speak clearly to their bereaved loved ones, how could readers have faith in the progressive nature of afterlife existence? How, furthermore, could the public be sure that they would remain their identifiable, ‘true’ selves forever in light of the new evidence from the front lines, where established personality was being completely blown apart by the sustained effects of combat? Should returnees from the trenches, or indeed the afterlife, no longer be capable of recognising themselves or their families in a convincing way, or of using language coherently, it was almost impossible to argue, as the spiritualists did, that humans retained their personal identities after death. Lodge’s awareness of this conundrum perhaps explains his removal of the shell shock comparison from the subsequent shorter version of the text, Raymond Revised, he published in 1922. Nonetheless, Lodge’s preliminary attempt to authorize theories of spirit identity by synchronizing them with the latest findings from the new field of military psychiatry reveals him to have been as committed to experimentation and modernization in his spiritualist investigations as in his wireless experimentation. For a fuller discussion of shell shock in Raymond, see my article in Viewpoint Magazine.